Sorry zombie lovers, Walking Dead isn't going to become the zombie version of Twilight. There's still a lengthy wait until Walking Dead season 2 hits AMC in the fall, but series creator Robert Kirkman has at least started talking about it. In an interview with the Hollywood Reporter, Kirkman confirmed a few of the show's upcoming story events, and sadly(?) nixed any possibility of zombie on human action. "I can absolutely rule that out," Kirkman said when asked if zombies and humans would ever get it on. "That's just awful." So vampire on human is fine, but zombie on human is "awful?" That sounds zombieist to me. On second thought, he's totally right. Bad idea. Kirkman also said that there won't be a big time difference between season 1 and season 2. The cast will still be reacting to the event that occurred at the end of the first season. 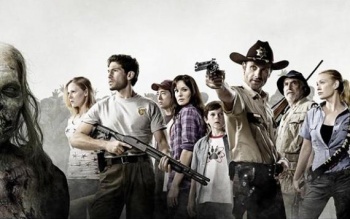 Similar to how the Walking Dead comic book operates, Kirkman revealed that more characters will both die and be introduced to the show's group of survivors. However, main character Rick is sticking around at least for the entirety of season 2. For fans that hope to ever find out where Walking Dead's zombies come from, another comment from Kirkman might break your hearts. "I don't know if we'll ever tell people how the zombies came about," he said. "I don't think it's important to the story which is about characters. When you delve into where they come from it delves into science fiction." Understandable, I suppose. Walking Dead season 2 is expected to start airing in October.